Have a look at post 4 of the thread. There are some links to general guide on how to use itamatrix. Also there are links to some other posts in this thread with itamatrix screenshots by rossmacd when searching for a LAX-PTY run and a OTP-PHX run. No problem, I've learnt so much here from others if you can give a little back it's great. You can remove CLT on the way out, and have a longer wait in PHL, and lose 40TP I just chose 7th on the way out to make sure it was 30 days in advance, often benefits the price. Funnily enough I have tried a few 'dry runs' with roosmacd's screenshots and they are very user friendly (thank you!) and I have read post 4. I'm getting there with the simple stuff but struggling with adding in extra stops and different classes... promise not just being lazy! @jh321 - Yes, Rossmacd is excellent on Matrix, always check his posts here. Even when it's not a fare or trip you want, I often learn Matrix methodology just from trying out his suggestions. rossmacd and cgtechuk like this. Thank you so much.... it's slowly all making sense... thank you all. And the 30 day thing explains some of the jumps in prices I saw today... so thank you for that explanation. I'd better get my skates on! I think the gold dream for this year is over haha. Very sad that there aren't any cheap QR flights anymore. I think it may be time to reconsider your relationship with your OH. .... Very sad that there aren't any cheap QR flights anymore. I doubt the 3 flights per day QR slot sitters for BA at LGW will be high yielding, so you may be in luck. Thank you! I've spent many hours reading this thread for the past week. That is a much better return on your investment - just make sure that you have the 4 qualifying flights needed for Gold. Related to this thread but the screen shots are extremely useful for IT/ITA dummies like me and not brought up with computers and now mostly self taught at a basic level. So, a massive thank you to KARFA, rossmacd and to everyone else who post screen shots, tips etc and advise many others including no doubt people like myself as above. rossmacd, flyerkit, madfish and 2 others like this. Just saw this on the AA forum and thought it looked a good price. 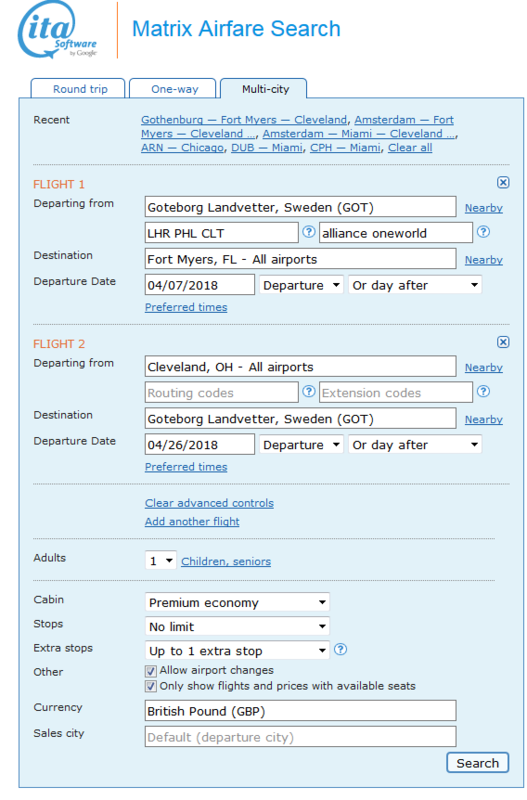 Best way for booking complicated ITA matrix flights? It always pays to check carefully. Newbie bronze member here and I am 40 TPs away from silver with an April 8th end date! Never done a TP run so asking for some advice from the TP gurus. Any suggestions for a quick TP run from Cincinnati CVG, DAY or CMH? It seems miami is the only option for a relatively cheap flight over the next few weeks or I would have position myself on the east coast to do PHL PHX or somewhere ex ORD. I have just installed itapowertools and I am still learning how to use it. If anyone has any suggestions it would be much appreciated. I will also happen to be in london for the next week visiting family, so while I would like to leave for the day to do a LGW JER or AMS run, might be poor form Alas.. they aren't even executive club members so they have no idea what's on the line! When I come back from the UK I could upgrade phl to cvg to first class for $340 which is a lot.. but I suppose would give me the 40tp with the least trouble. Hi bgav00, and welcome to the BA Tier Point Run thread! 1) When earning a tier level (bronze/silver/gold), BA has traditionally allowed one to credit tier points from as late as two weeks after the official end of your tier point year. Thus, you actually should have until April 22nd to get your remaining 40 TP. Iberia flights also count towards the 4 BA flight quota. I did something like LHR-MAD-IBZ-PMI-MAD last year to get my 4 flights done.